Melissa Bracken is the artist and founder of The Happy Groundhog Studio. 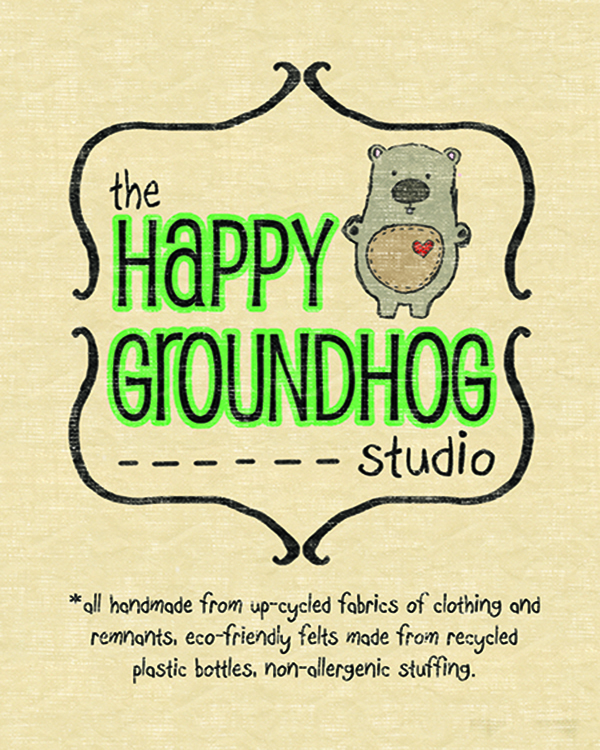 The Happy Groundhog Studio makes Eco-Friendly handmade critters, monsters and pillows with a heart. These Heirloom quality whimsical stuffed creatures are lovingly hand stitched and crafted from eco-friendly felts, upcycled sweaters, and fabrics. “When I was young my grandmother, who we called Granny B, made sock monkeys, stuffed bunnies, and all sorts of wonderful gifts for me, my sisters and cousins. She was so creative and unique. The sock monkey she made me became my favorite stuffed animal and I still have it to this day. I actually passed it down to my children.” Melissa’s grandmother recognized an artistic talent and also taught her how to sew. Later, Melissa inherited her sewing supplies and the best pair of fabric scissors ever! Melissa soon took her talents to the Art Academy Of Cincinnati and earned a BFA in sculpture. After graduation she took a side step into the corporate retail world and eventually became a mama and aunt. During this time she was looking to create art while the little were around and could also enjoy. Wanting to give unique handmade gifts to the special kids in her life, she called upon the skills that her grandmother taught to up-cycle sweaters into stuffed plush critters. With her crazy love of animals and Granny B’s spirit in her heart came the line of plush creatures and The Happy Groundhog Studio was born. Melissa also has a huge love for her home state of Ohio, and wanted to honor that in her work. She then created her successful line of state pillows which celebrate the love for her home state and city. She has grown this line to include all states so others can celebrate their hometown pride as well. So, just because you didn’t have a Granny B. that sewed for you, you can still give a gift of a wonderfully handmade and lovable critter that will be cherished for years. At the end of the day, we hope you have found something to smile about!